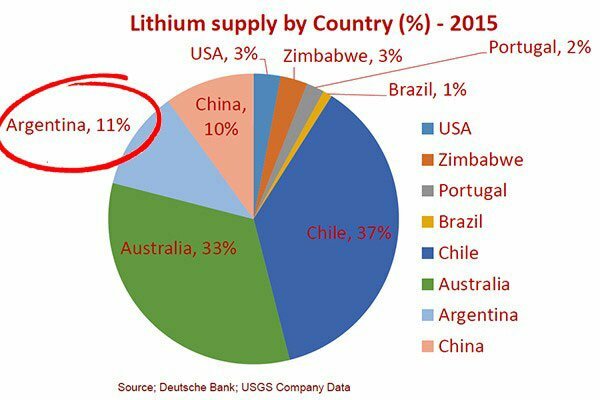 Two thirds of the world’s lithium reserves are found in the “Lithium Triangle” of South America – Chile, Bolivia and Argentina. With surging demand for lithium over the next decade, the country earmarked with the biggest growth in supply, driven by the high prospectivity of its geology, is Argentina. Yet with compelling prospectivity, but no hard rock resources discovered to date, where is all this Argentine lithium going to come from? One $16M capped ASX company is intent on finding it. This company has just acquired an advanced lithium project, including 70,000 hectares of land which includes historically mined, lithium-rich targets. The newly acquired Ansotana Project has similar geology to the $620M WA-based Pilbara Minerals and Greenbushes, the largest hard rock lithium mine in the world and it is in addition to its Catamarca Lithium Prospect. Historical small scale mining in Argentina occurred post World War 2, for lithium minerals but the focus was not hard rock pegmatites – the primary source of lithium. This company has staked these old forgotten lithium mines in search of the pegmatites. These are the same type of tantalum-pegmatites found in Australia’s Pilbara region. Pilbara Minerals, one of Australia’s biggest lithium explorers, currently capped at over $600 million, holds the world’s largest hard rock spodumene deposit in the world (128mt @ 1.22% Li2O). Today’s company is currently capped at $20 million, and has 700 km 2 over areas known to be lithium rich, and has just raised over $3 million to advance its exploration. This is relatively early stage exploration compared to Pilbara Minerals, but the company is moving quickly, with the aim of mining within 18 months; in an effort to bridge the gap in company valuation – which is where the upside lies here for new investors. Remember, however, that this is still an early stage company and whether it can bridge the valuation gap remains to be seen. So, if considering this stock for your portfolio, seek professional financial advice for further information. Lithium is not the only feather in this ASX stock’s resources cap. 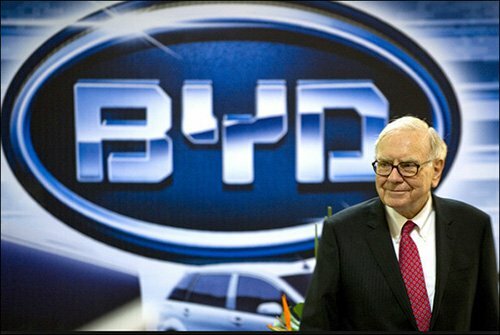 Whilst its main focus is on lithium in Argentina, the company also has copper targets in booming Peru, where it has just struck a major deal with Canada’s largest copper producer, First Quantum Minerals that will see the company carried financially all the way through to a decision to mine. 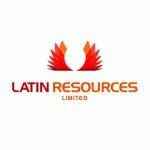 Latin Resources (ASX:LRS) has a bold ambition – the company is seeking to control the majority of the known hard rock lithium bearing pegmatites in Argentina. Essentially the fast moving LRS is positioning itself to take first bite of the Argentinian lithium cherry, picking up the best locations to drill and mine in that country. Working in LRS’ favour is that the type of lithium currently extracted from the ‘lithium triangle’ (Chile, Peru and Argentina) comes from brine in the lithium rich salt lakes, with currently no hard rock pegmatite mining taking place in Argentina... yet. Given LRS’ significant land holding, which covers over an enormous 100,000 hectares, dotted with historic small scale surface mines, the company is on the front foot in the region to establish a dominant lithium position. It’s only a matter of time before a large hard rock lithium discovery is made in Argentina, and LRS is intent on making that discovery. LRS is looking to go from its current position as an explorer to producer inside 18 months – which would no doubt see the company capped at much, much larger levels than it is today. 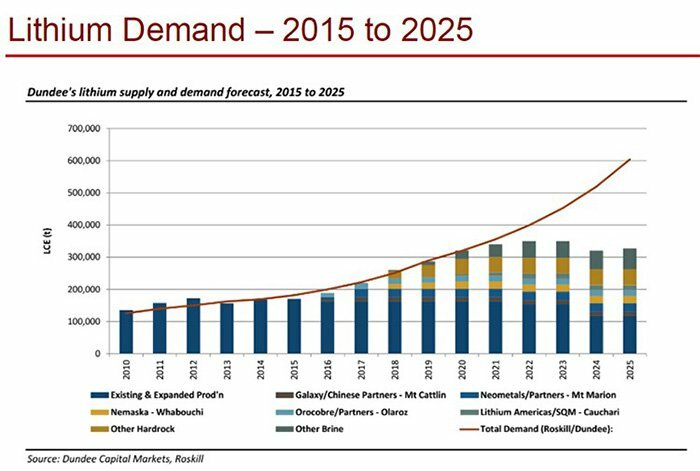 With lithium demand set to potentially skyrocket over the next decade on the back of rising demand for electric cars and battery power, the large tenements held by LRS could well prove their worth. Another major boost for LRS could be the newly elected Argentine government which has already removed a 5% mining tax and plans to introduce further legislation to make it easier for mining companies to operate in the country. Government support is already making life easier for the country’s resource players and LRS has been making some substantial moves. LRS has just signed a binding term sheet for purchase of the Ansotana lithium – tantalum pegmatite project in Salta, Argentina. The area was mined between 1943 to 1945 by the Ansotana Mining Company. LRS has much going for it: peripheral government support, location, money in the bank and a potential first mover advantage in what could be a very prospective region of South America. As we mentioned above, two-thirds of the world’s known lithium deposits are located in Argentina, Bolivia and Chile. The chart below gives you an indication of the dominance of this region. Currently, Argentina supplies 11% of the world’s lithium, but by 2025, it is anticipated that Argentina will account for 29% of global lithium supply . 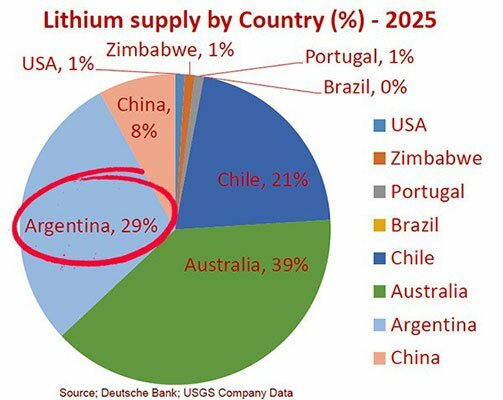 This growth will be due to the way lithium is mined, with Argentina attempting to become the first country in the region to target pegmatites over brine. As a result of the extraction method being new to Argentina, the country is looking to increase its role in the global lithium space and show that it’s open for business. As such, and as an illustration of the commitment to these types of project by the Argentine government, permits applied for by LRS will be fast tracked. So just how important is government support? The newly installed federal government in Argentina has made the nation’s mining sector a priority. Led by President Mauricio Macri, the government has revoked the 5% tax imposed on mining and energy companies by the previous administration. This past tax saw investors flee the country and as a consequence the sector shrunk, whilst also being hurt by falling commodity prices. The current government is attempting to turn this situation around, and it looks as if LRS has arrived in the country at the right time. Efforts to revive investments in the Argentine mining sector have seen the unification of mining regulations that would permit open-pit mines to operate throughout the country. Despite being mineral rich, Argentina has fallen behind its neighbours Chile and Peru when it comes to mining investment. This has been due to the way mining laws are imposed in the country. Each of the 23 provinces in Argentina has their own mining laws, making the regulatory process laborious for companies wishing to enter the region. It is felt that unifying regulations would attract mineral companies and investors back to the region – and this is what Argentina is seeking to do. With less restrictive laws currently in place in Chile and Peru, the two nations are expecting $30-50B in mining investment over the next five years. The new Argentine government recognises the opportunity for their country and hence is proactively seeking to cash in on the rise of South American resource exploration. Analysts predict that there is $400B worth of untapped mining resources in Argentina, of which LRS now owns a potentially large chunk via its strategic land holding. Yet this still remains an early stage play and its land holding may not necessarily equate to discoveries or production, so if considering this stock for your portfolio seek professional financial advice. LRS’ potential land holding can be seen in the map below. Its Catamarca play is shaded in green. Will this be the first time lithium pegmatites are mined in Argentina? The lithium triangle is currently only mined for its lithium resources found in salt lake brine. LRS has a first mover strategic advantage in going after the lithium pegmatites found in the hard rock. The major success of Pilbara Minerals (ASX:PLS) in the Pilbara of WA, and Neometals (ASX:NMT) in Australia targeting hard rock lithium and the pegmatites are examples of how big this strategic lithium move could be for LRS. Whilst Pilbara Minerals has the world’s largest hard rock spodumene tantalum deposit on its 32 square km of tenements, LRS holds reign over 700 square km, in a region with striking similarities to the Pilbara ... that’s over 21 times larger. The map below gives you some indication of just how large this play is. So now you know the size, how does it intend to extract its lithium? LRS has signed a joint venture deal with Platypus Minerals Ltd (ASX:PLP) with relation to its wholly owned subsidiary Lepidico. L-Max technology is a proprietary metallurgical process that extracts lithium from non-conventional sources, specifically Li-rich mica minerals such as lepidolite and zinnwaldite; which is found at El Quemado (see the top of the map above). 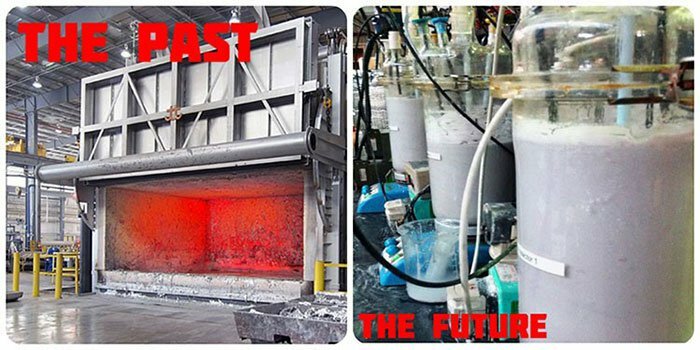 The L-Max technology provides LRS with an energy efficient process of processing the ore to a final battery grade lithium carbonate in the one facility. The superior technology offered through LRS’ partnership with Platypus Minerals offers significant cost and operational efficiencies to its El Quemado lithium project in Argentina. As mentioned in regards to the El Quemado project, the lepidolite can be treated at the Lepidico plant and have the lithium carbonate shipped directly to the United States. With no lithium carbonate plants in the United States, this deal with Lepidico saves LRS having to ship the ore to Asia for further processing. So now you know how the lithium will be extracted, it’s time to look at LRS’ prospects. Located in the lithium triangle, Catamarca offers LRS a pure spodumene play. Small scale mining occurred in the province for 80 years and has produced over 10,000t of Lithium minerals, and also 1Mt of ceramic feldspar, 50,000t of mica, 25,000t of beryl, 45t of tantalum minerals, and 10t of bismuth minerals. Recent rock chip sampling at the site returned assay results with grades at high as 6.74% lithium and 6.97% lithium. Granting of the concessions is now imminent with LRS awaiting final approval from the Catamarca mines department. An announcement will be made to market once approval has been received. Drilling at the site is expected to commence Q4 2016, with completion of field exploration and drill targets set to occur by the end of October. By Q1 2017, LRS plans to have a JORC compliant resource, which would place LRS as one of only five-to-six companies on the ASX that have a JORC lithium resource. Assuming a strong commercial resource is in the ground, construction of a spodumene concentrate plant is set for Q3 2017, with production at the site to commence Q4 2018. The plant could produce a spodumene concentrate at 5.5-6% which will be shipped to China who can turn it into a lithium carbonate. The Catamarca region itself is well equipped surrounding infrastructure and is accessible by highway with flat terrain leading into the area. The nearby town is equipped with a railway and loading facility only 30km away from the project. The mining and crushing of the spodumene could occur on site and be taken to the nearby town for further processing, consisting of crushing and grinding to get a spodumene concentrate. From there, the concentrate will be placed on the railway leading into the main port in Buenos Aires where the lithium resource can be shipped to the United States, with Argentina strategically positioned to service the high demand market. 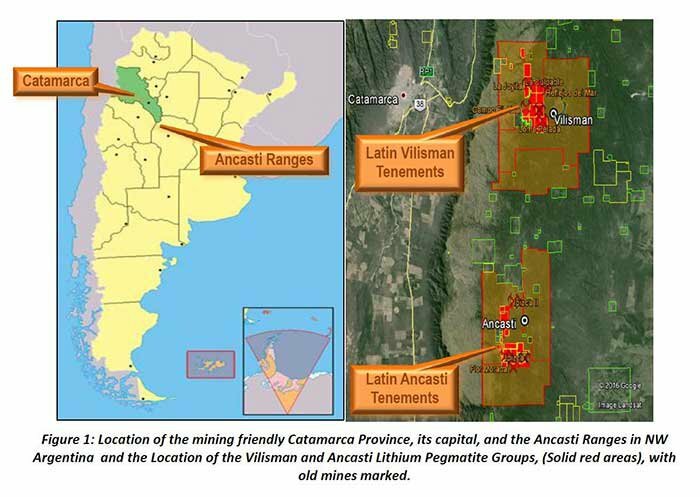 While the Catamarca prospect puts LRS in a strong regional position, its latest acquisition of Ansotana further strengthens its Argentine lithium play. A binding purchase and earn-in agreement to acquire up to a 90% interest in several mining concessions in the province of Salta has just been signed, with a 60 day due diligence period. The concessions covered in the agreement are known as the Ansotana Project, covering 44,290 hectares of lithium and tantalum pegmatites in the El Quemado pegmatite district, offering LRS the potential to further expand its lithium portfolio in Argentina. The Ansotana area was mined from 1943 to 1945 for Tantalum and Bismuth by the Ansotana Mining Company during World War 2. However the pegmatites in the region are known to range in strike length up to 800m with widths up to 40m. Here’s the lay of the land, with the red highlighted section indicating the concessions that form part of the Ansotana project. The Ansotana mine previously produced commercial quantities of tantalum and bismuth. They are also known to contain the commercially important lithium minerals spodumene, amblygonite and lepidolite. In fact, the area consists of complex lithium rich pegmatites and hosts a range of minerals including tantalite, beryl and the lithium bearing minerals such as lepidolite, montebrasite and spodumene. The purchase, if successfully completed, will serve to advance LRS’ ambitions as they look to secure known hard rock lithium bearing pegmatites in Argentina. LRS will carry out detailed Due Diligence on the Ansotana project – to commence 60 days from access to the site – to assess the prospective nature of the pegmatites for lithium. The plan is to commence due diligence on the Ansotana project in October, with the major focus to ascertain if there is viable lithium mineralisation to prove up a JORC resource. This earn in agreement will potentially further allow LRS to secure known lithium targets to build on its already substantial portfolio of lithium exploration concessions in the Catamarca district of Argentina. LRS will be able to determine whether there is viable lithium mineralized resource before any substantial payment including shares to the vendor. LRS to provide an exploration capital contribution of US$3,000,000 over a 3 year period. There are several reasons why LRS wants to acquire Ansotana. 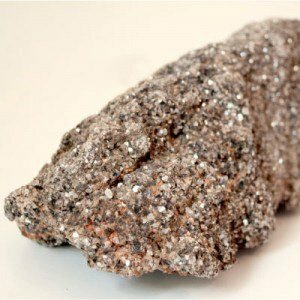 Lepidolite (lithium Mica) can be treated in a Lepidico plant nearby and turned directly into lithium carbonate, ready to be shipped straight to Nevada to the Tesla factory (for example). It is also showing how similar the geology is to WA-based Pilbara Minerals and Greenbushes, which as we pointed out earlier is the largest hard rock lithium mine in the world. Remember the $620M capped PLS is still considered to be an emerging strategic metals producer. LRS is hoping to follow a similar path. LRS is still an early stage play, however, and there is no guarantee the LRS share price will go up. As such invest with caution and seek professional financial advice if considering this stock for your portfolio. 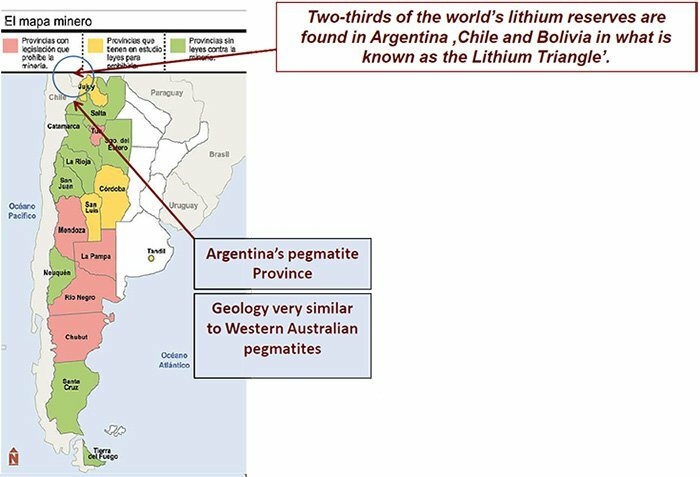 LRS’ contracted exploration team deployed in Argentina is the ‘lithium triangle’ specialists IMEx Consultants. The IMEx team boasts a wealth of experience with President Iain Scarr having been in the mineral exploration game for 36 years. The team also includes senior geologists, associates who can sign off on environmental and social leases in the provinces concerned, the world renowned hard-rock process and chemical engineer Vijay Mehta and other chemical engineers certified and experienced in Argentina. IMEx services clients around the world including Rio Tinto and Sirius Minerals – and now they are working with LRS too. 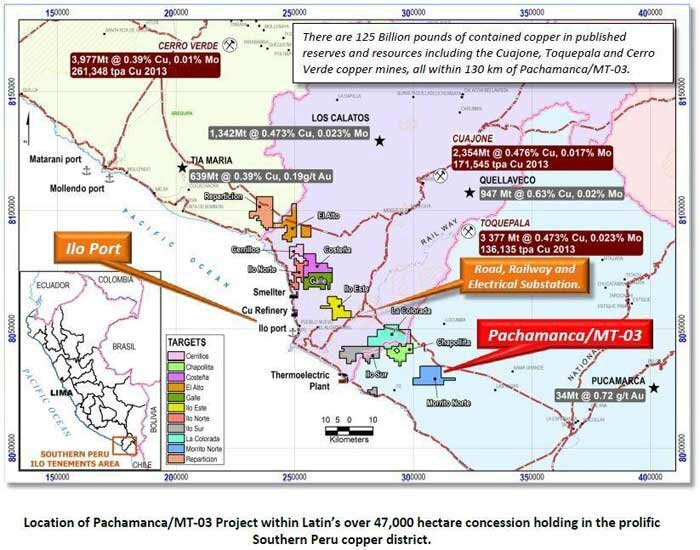 Aside from lithium in Argentina, LRS is also pursuing its copper interests in Peru – sitting in southern Peru is LRS’ Pachamanca/MT-03 Copper Project. The surrounding infrastructure includes an 80km sealed highway linking the project to the main port in Ilo. The project also features high tension power lines and is adjacent to the Panamerican Highway, significantly reducing capital costs typically required to get a project of this nature off the ground. Through its 100% owned subsidiary, Peruvian Latin Resources SAC, LRS has signed a binding terms sheet agreement with Canada’s largest copper producer First Quantum Minerals. The terms of the rights assignment and earn-in option to transfer up to 80% ownership of LRS’ Pachamanca/MT-03 Project to Minera Antares Peru SAC, the Peruvian subsidiary of First Quantum. Antares may elect to proceed with a rights assignment and an option to earn an initial 51% of the project by completing 4,000m of drilling within 6 months of obtaining drilling approvals. As a result of the deal, LRS will be free carried all the way through to the decision to mine, meaning no funds are needed from LRS to progress operations. Through the deal, Antares can earn up to a total 80% of the project when technical documentation of work completed is provided to support a decision to mine. Antares will then have an option to buy LRS’ remaining 20% share based on an independent valuation, if that was to go ahead LRS would retain a 2% NSR royalty. The NSR royalty can be reduced to 1% in exchange for Antares paying US$40M in cash to LRS. 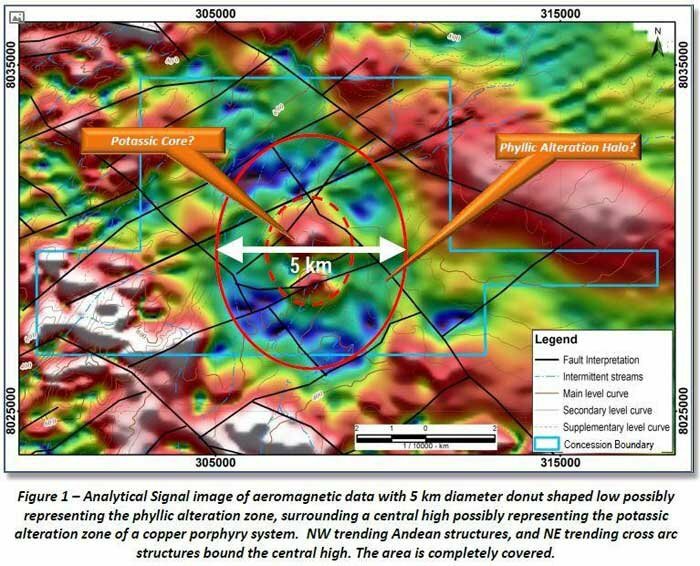 In the meantime Antares is conducting an IP survey over the target which will assist in identifying targets for the upcoming drilling campaign to confirm the presence of a suitable mineralised system. Due to this deal, LRS will primarily focus on progressing the lithium projects located in Argentina. LRS recently raised $3.4M via a placement that saw participation from sophisticated and professional investors. The capital raising will see the investors receive 309,090,909 shares at a price of $0.011 per share. The funds raised will be used to secure the leases of lithium bearing pegmatite properties identified in Argentina, namely El Quemado, and speed up exploration at the project. As mentioned previously, the copper project in Peru no longer requires LRS to lay out any capital, hence management has decided to shift resources towards developing the lithium projects. LRS has accessed a number of mineralised positions at Catamarca and assuming continued strong exploration results, the company is looking to advance those towards production in a clear 18 month detailed plan. Mapping and sampling has begun at the sites secured with the plant to identify immediate drill targets. Whilst it is still very early in terms of exploration, recent rock chip sampling at Catamarca conducted by LRS returned assays with grades at high as 6.74% lithium and 6.97% lithium, indicating clear potential. 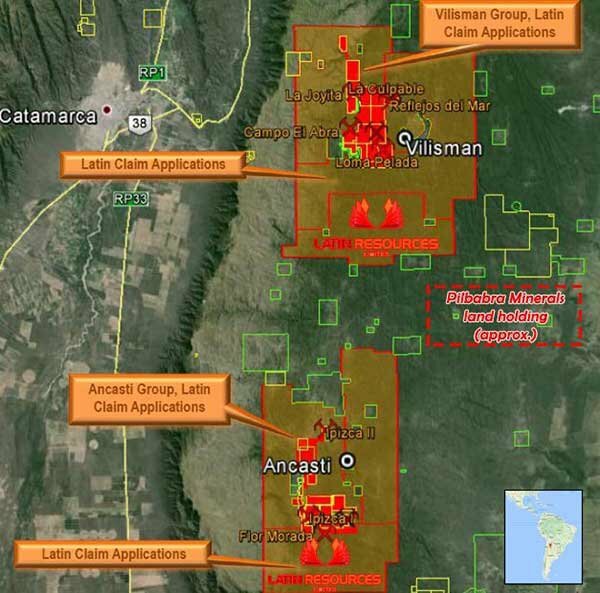 The Villsman and Ascasti projects add 7,051 hectares of potential lithium exploration ground. Successful acquisition of El Quemado would add to LRS’ Argentinean portfolio of lithium assets and align with the company’s goal of acquiring hard rock pegmatite concessions in the region. The signed binding term sheet for the acquisition of the Ansotana pegmatite project in Salta, further adds to LRS’ strategy of acquiring known lithium deposits in Argentina. Adding 44,290 hectares of known lithium terrain to LRS’ portfolio. 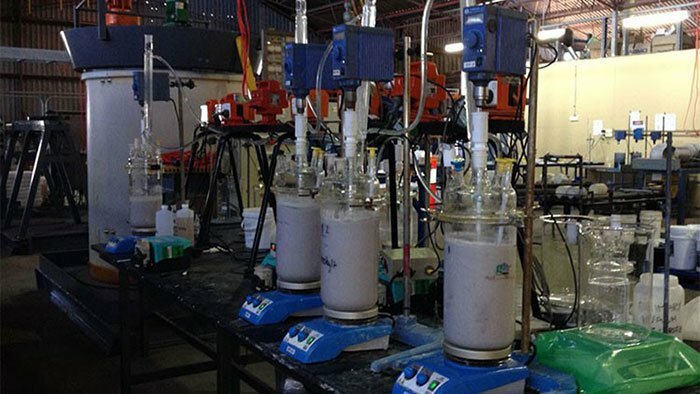 Through its partnership with Platypus Minerals’ wholly owned subsidiary Lepidico, LRS also has access to the L-Max technology for extracting and processing lithium from the ore, allowing for immediate shipment to potential buyers. The Pachamanca/MT-03 Project copper project in Peru is being funded and progressed by Canadian miner First Quantum Minerals. LRS will receive US$500,000 in payments from First Quantum Minerals as the project progresses, who in return will increase their stake in the project. Through this strategy, LRS is free carried all the way through to the decision to mine, allowing the company to focus on its lithium projects and have the copper play as a bonus if it proves to be feasible. LRS’ management team has both strong experience in the industry and the South American region. The team’s vast knowledge is backed by over six years of exploration work and $20M spent in obtaining the best quality pegmatite deposits in the region, with over 70,000 hectares acquired in its portfolio. With Argentina’s lithium supply ripe for change and the federal government actively boosting the mining sector through favourable laws, LRS is on the frontier in one of the hottest mining locations on the planet, the Lithium Triangle.